Day 1 of the Extravaganza begins with some nice reader swag. You guessed it: books! The following are my FAVORITE FANTASY BOOKS, and I want to spread their awesomeness around. Whoever wins gets to pick one of the listed books, and I’ll have the online bookstore of your choice (e.g. B&N, Borders, Amazon, etc.) send it your way. Or, if you don’t want to watch me ramble on for 6 minutes, then just scroll down for the inside scoop. Oh, and I apologize for how blue and washed-out I look. I blame it on the poor lighting, stormy weather, and crappy camera. Scroll to the bottom and leave a friendly comment. 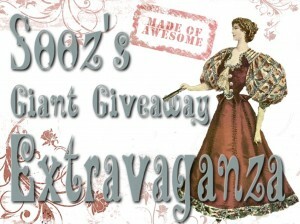 If you have blogged or tweeted about the Extravaganza Day 1, let me know in the comments (you can always come back and comment again if you decide to blog/tweet later). You get your name in the drawing an extra time for tweeting or blogging. I’ll put everyone’s names in a random-selector-thingy, and next Monday, I’ll announce the winner! What are your favorite fantasy or science fiction books? Have you read any of the ones I’m giving away? And, if so, did you enjoy them/hate them/none of the above? ?